Andy Reid on the Tyco BMW at Snetterton. Young guns Josh Elliott and Andy Reid lead a new-look line-up for the Tyco BMW team in the MCE British Superbike Championship at Snetterton this weekend. Ballinamallard rider Elliott was due to fill in for the injured Ian Hutchinson again in the Superstock 1000 class after returning to the series at Knockhill. However, Christian Iddon was a late withdrawal on Friday due to the arm injury he suffered in a crash at the Scottish circuit a fortnight ago and Elliott was given the nod to deputise on the S1000RR Superbike. He teams up with Jordanstown prospect Reid, who was brought into the team during the week to make his full BSB debut following the departure of big winter signing Davide Giugliano. 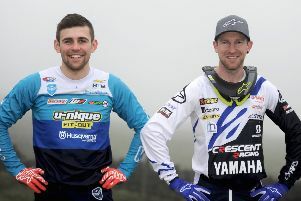 It is a welcome turnaround in fortunes for the Northern Ireland duo, who were both left without a ride in 2017 after being priced out of consideration as team bosses demanded personal budgets upwards of £50,000. Reid was 19th fastest in FP2 with Elliott two places behind in 21st. Carrick’s Glenn Irwin is ruled out through injury on the PBM Ducati. His team-mate, Shane Byrne, was fastest from Honda’s Jason O’Halloran and Peter Hickman (Smiths BMW). Michael Laverty was 17th on the McAMS Yamaha. Meanwhile, Keith Farmer goes into Saturday’s Dickies British Supersport Sprint race at Snetterton (5.20pm) gunning for a third successive victory on the Team Appleyard Macadam Yamaha. The Clogher man won both races at Knockhill in Scotland a fortnight ago to move into contention for the title. Farmer takes on fellow Northern Ireland riders Andrew Irwin (Gearlink Kawasaki) and David Allingham (EHA Racing Yamaha). In free practice, Farmer came through in the second session to head the times by 0.276s from Alastair Seeley, who is back in action this weekend on the Team Quattro Spirit Moto2 machine. Carrick man Seeley, though, is ineligible for championship points and therefore is irrelevant in terms of the title. Joe Francis was third fastest on the Halsall Yamaha ahead of Dubliner Jack Kennedy (MV Agusta), with Irwin – who was fastest in FP1 – in fifth, eight tenths back on Farmer. Allingham was seventh quickest on his Yamaha R6 behind Ben Currie.